Oh no! Gwen's laid an egg, Steve's gone bonkers, Lily's about to be eaten and a tree just ran by - if this sounds like a normal day for you, then stop, find a shady spot down by the river and read this book. Here's a great Australian story for teaching kids about helping others in a healthy way. Based on Psalm 1. When Jesus wanted to change lives he told stories. That's what we do at Lost Sheep - and at the centre of our stories is Jesus. Some stories are about him, some are by him, but all of them point to him. We take the spirituality of children seriously but also believe the gospel is fun. Lost Sheep create resources to assist parents, teachers and children's workers build the faith of kids in Australia and around the world. 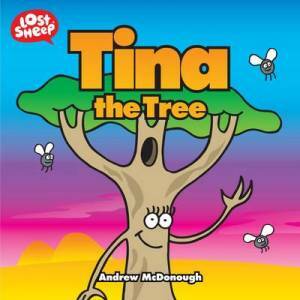 Tina The Tree by Andrew Mcdonough was published by Authentic in September 2010 and is our 16385th best seller. The ISBN for Tina The Tree is 9781921229381. Be the first to review Tina The Tree! Got a question? No problem! Just click here to ask us about Tina The Tree.